Who are we kidding? There's no separation between "work" and "life." As a freelance writer, my life and work are indistinguishable. The anxieties—article deadlines, family drama, leg waxing—are thrown into one homogeneous pool of chronic stress. Work-life balance must be simpler for nine-to-fivers, right? A quick work day bookended by an hour-long commute pumping the clutch in stop-and-go. Work-life balance is hard no matter who you are, or how long your commute. Why? Because work-life balance is a big hoax. The more we believe in it, the more miserable we become. "Work" and "life" aren't binary. "Balance" is dynamic, not static. And "life" is much more complex than "non-work." Here's the first myth: Your existence has two components: "work" and "life." Not true. Stew Friedman says it beautifully in this piece for Harvard Business Review, "The idea that 'work' competes with 'life' ignores that 'life' is actually the intersection and interaction of four major domains: work, home, community, and the private self." Finding balance isn't just equalizing "life" and "work"—it varies, sometimes on a daily basis. Balance means shifting with the priorities of the day, week, month and year. And that's okay. 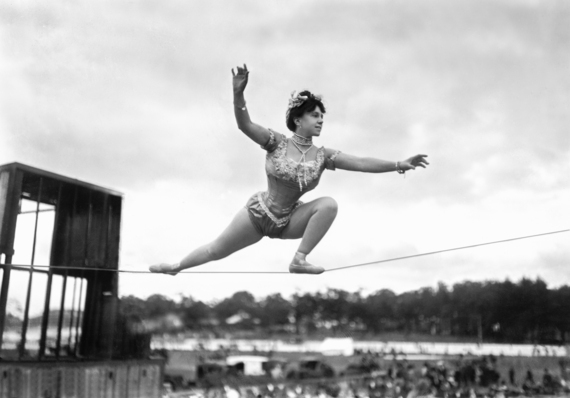 We wrongly believe that work-life balance is something you can "achieve." This idea makes us miserable. Balance isn't static—it's a state of constant flux. Dan Thurmon uses the example of a handstand. In his Tedx Talk, he does a handstand onstage. And it's damn good one, too. But if you look closely, he's moving. Little to the left, little to the right...he's making microadjustments to keep himself upside down. He's balanced, but not static. "It's a process of constant adjustments, decisions, corrections, responding to opportunities and challenges," Thurmon says. Basically you're about to fall over at any moment. And that's normal. Thurmon says we have to stop thinking there will be a moment "where it all evens out." Juggling work, family, and self-fulfillment involves constant adjustments and priority shifts. A "balanced" day doesn't mean you accomplish more in less time. A lot of work-life balance peddlers preach super-human productivity. The key is not to cram more things into your day, but rather evaluate what matters and reallocate time to those things. What's beautiful, Thurmon explains, is that by slowing down you feel like you have more time, not less. "It's not about increasing your pace, because life speeds right up with you. Ironically, by slowing down even a little, you begin to notice those spaces, those opportunities, and they expand for you."
. "If you try to get all the value from one side, all the value disappears." Feelings of purpose and balance flow from experiencing both accomplishment and joy—simultaneously, separately, or however—at some point in your day. What's my purpose in life? I just want to achieve something today and I want to enjoy something today. And if I do both of those things today, I'm going to have a pretty good day. And if I do both of those things every day, for the rest of my life... I'm going to have a pretty good life. So, where is the intersection of enjoyment and achievement? Behold Lauren Bacon's "Balance Matrix." Using the x-axis to map priorities and the y-axis to measure energy, she's created four quadrants where the upper right ("Fun and Purpose" quadrant) is the sweet spot. Her argument is that instead thinking that fun moments are only a reward for suffering through the drudgery of work, we can shift our perspective to find reward in the work. "Your work-that-doesn't-feel-like work is precisely the point of your life," she writes. "Maybe you can't quit your day job or fire your kids...but a little tweaking can do wonders." You can't have your cake and eat it too, right? Wrong. You can have all the cakes and all the eating. And here's how: stop believing in the work-life balance hoax. Instead, make peace with the flux. Know that some days will feel more balanced than others. Balance is not a state of being, it's a fulcrum: the dynamic middle point of push and pull. To make it easier to navigate, Jim Bird says to divide your world into four main quadrants—work, family, friends, and self—and try to find achievement and enjoyment in each quadrant daily. For me, achievement and enjoyment sometimes happen at the same time ("Boom! I just smashed that article draft! "), sometimes they happen separately ("Thank god I finished that web copy. Now let's play kickball.") What's important is the movement—that soft sway on the fulcrum. Balance is the little daily efforts to avoid tipping. As Stew Friedman writes, "One can cultivate a life in which values, actions, social contribution, and personal growth exist in harmony...not every single day—that's the impossible myth of 'work-life balance'—but over the course of a lifetime." This is a life's work. But don't let that intimidate you. You can have more balance today. Right now. It's a mind set. It's a daily practice. You're capable in this very moment.